Even though we have set up individualized feeding stations for each of our three cats in order to keep their diets separate, occasionally, they discover and invent ways to circumvent our efforts. Fortunately, this is a rare occurrence. Baxter has his own food box, just like the other two cats in our household. Baxter has observed Brodie exiting his own food box and has discovered an opportunity to enter the box at a special time when the kitty door is still open as Brodie passes through it. Baxter simply enters the kitty door before it closes behind Brodie, thereby "hacking" his way into the "forbidden zone" of Brodie's food box. "Smart" is a relative term, however. Despite the fact that Baxter is determined to, and successful at getting into Brodie's food box, it just so happens that, in this case, the food in Brodie's box is exactly the same as the food in Baxter's box. Baxter thinks the food in Brodie's box is somehow better than his own food. The only difference is the location, and the fact that the food in Brodie's box is Brodie's food, and not Baxter's food. In our household, Baxter thinks he "owns" everything so this is his way of trying to convince us that he now owns Brodie's food. Individualized feeding stations works very well 99% of the time. Once in a while we have a "glitch" like this one. Still it is a great way to isolate diets of cats in multiple-cat households. Squirrels are cute and everything, but can be a real nuisance. Especially when you're trying to feed just the birds. We had invested in a weight-sensitive seed feeder, and a cage for other seed feeders. We had been hanging a suet block feeder out at one of the ends of the bird feeder structure's arms. Recently we discovered a squirrel had found it. So we had a number of options. We could increase the height of the post, and install a post baffle, but because the deck railing was 36" high, the baffle would have to be positioned at least 4-feet above that, making it very difficult for us to actually reach the feeders to refill them. After doing a little research I decided to try 1/2" hardware cloth. I bought a yard of 24" wide hardware cloth (mesh) from the local hardware store. 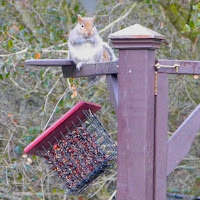 I cut and bent it to fit inside the suet feeder. 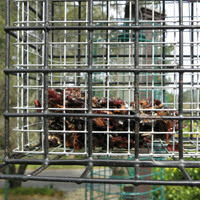 It needed to be a tight fit so the suet blocks could still be inserted easily. After about 20 minutes of cutting and bending, I finished. On testing, the squirrel tried several times but gave up after a few days. The mesh is large enough so the woodpeckers and other birds can dine to their heart's content. Now entertaining our cats go a little less expensive!